International Journal of Research in Health Sciences,2015,3,2,345-347. 1,2-Assistant Professor, 3-Professor, Department of Anatomy, Sri Padmavathi Medical College for women, Tirupati, Andhra Pradesh, INDIA. When the veins draining the left kidney surround the abdominal aorta in the form of a collar it is known as aortic renal collar. This condition has embryological basis and is referred as circum- aortic left renal vein or circum aortic renal collar in the literature. This condition results from persistence of embryonic veins or anastomosis between them that usually disappear to form left renal vein. It is a potentially hazardous developmental anomaly of left renal vein. In the present study on 50 adult cadaveric kidneys for renal vein variations one adult male cadaver presented circum aortic renal collar formed by left renal vein. The percentage incidence of circum aortic renal collar in the present study was 2%. 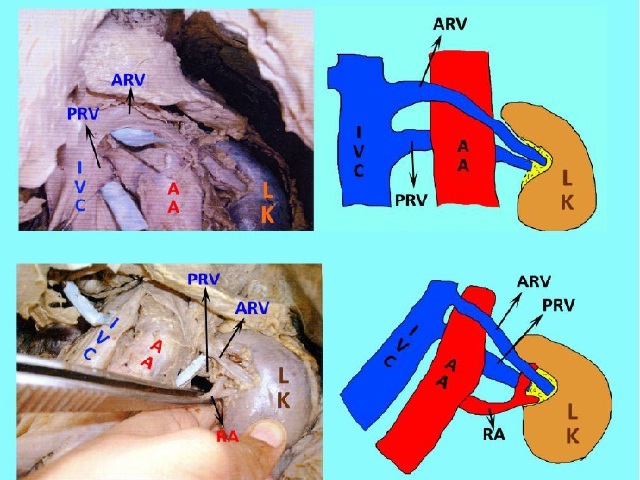 Detailed knowledge of developmental variations of left renal vein is important for differential diagnosis of retroperitoneal pathologies and in retroperitoneal surgical interventions.